The Board of Directors is pleased and proud to announce that NCDXF has received a very substantial contribution from the estate of John Beck, W4AI. Mr. Beck passed away in February 2008 at the age of 89. Mr. Beck was originally licensed as W6MHB in San Francisco, California. His first DXpedition took place in 1955 as TI9MHB, Cocos Island. Mr. Beck joined RCA in 1956 and was an engineer for many of the tracking stations in the Air Force Eastern Test Range. During this assignment, Mr. Beck operated as VP7BT, Bahamas; VQ9J, Seychelles; VP2A and VP2AAA, Antigua; and ZD8J, Ascension Island. Following his East Coast assignment, Mr. Beck worked for RCA in Alaska where he held the call KL7AI. Upon his retirement from RCA in 1992, Mr. Beck relocated to Florida where he held the call W4AI. Mr. Beck was an early member of the Northern California DX Club and the Florida Contest Group. Mr. Beck was an avid DXer and contester. He had worked all but two countries, all on CW. In 1966 and 1967, Mr. Beck, signing ZD8J, was No. 1 in the world in the CQWW CW contest. Mr. Beck was most proud of the letters he received from contest sponsors praising the accuracy and quality of the contest logs he submitted. This, of course, was a long time before computers made logging and operating during a contest more or less automatic. Mr. Beck logged with a pencil and paper and then typed the logs for submission. The contribution to NCDXF was made possible through the efforts of Mr. Beck's executor, Dale Strieter, W4QM. For the old-timers who may recognize this call, Mr. Strieter has quite a DXpedition resume: 1958 and 1969 Navassa Island; 1961 and 1969 HK0TU, Malpelo Island; 1962 HK0B, Baja Nuevo; 1962 KS4BF, Serrana Bank; 1965 CE0XA, San Felix; 1986-2001 VQ9QM, Diego Garcia; and a number of Caribbean contest DXpeditions. The Board expresses its sincere appreciation to Mr. Strieter for making this contribution possible. 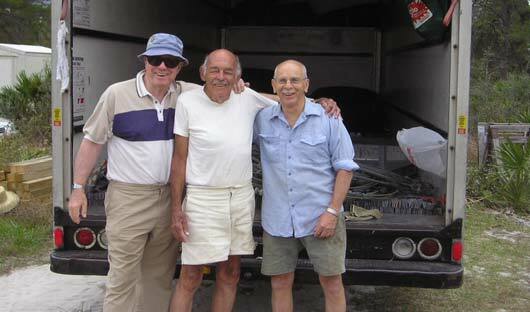 L-R Fred K4LQ, John W4AI, Dale W4QM in front of a truckload of W4AI tower sections etc. headed to Miami for trans shipment to GM3POI in September 2004.